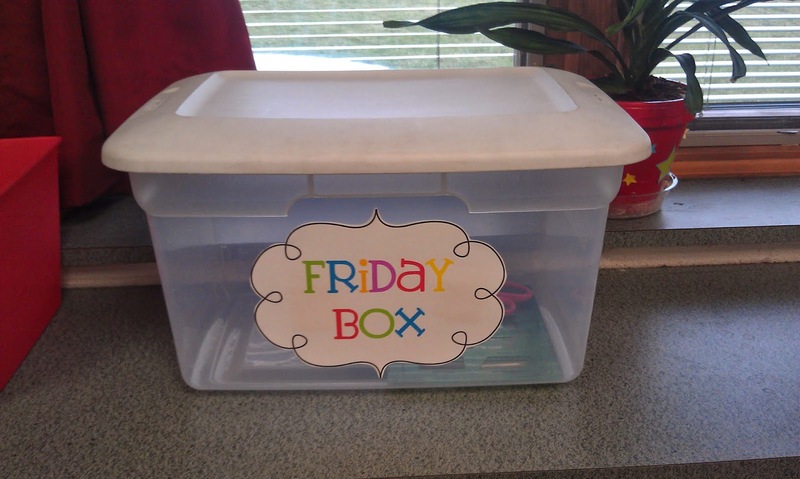 The Open Door Classroom: "Friday Box"
Do your students have a hard time keeping track of their things? Every day at the end of the day, I go around picking up glue sticks, scissors, dry erase markers, pencils, etc. (even though we have two floor cleaner class jobs that are supposed to do this!). My students are losing things like crazy! To teach them the importance of taking care of their things, I introduced them to the "Friday Box" this week. I love that idea! I really think alot of children are not made to be responsible at home and that carries through to the classroom. Last year I made my kiddos responsible for their group pencil boxes (each table had one) and with cries of "We have no pencils" I would say "Be a problem solver, the pencil box is your responsibility". I had a box of new pencils, glue sticks etc that they could replenish supplies from and each table had to mark down how many of each item they took. We soon saw which table were the most responsible and they were rewarded once a week. I think it helped my kiddos to develop group and personal responsibility. I love this idea!! I number most of my kids supplies so all they have to do is look for the number but they still manage to lose things! My classroom looks like a storm went through it at the end of each day (despite my "trash monsters" that are supposed to pick up the room. I may have to implement this. Thank you so much for the idea. By the way, I am your newest follower! I found you through Heather's Heart. Thanks for the great ideas! Just saw this idea on Pinterest and came to read about it. What a great idea!